Puma Engineering Ltd, a manufacturer of the World’s most powerful motorcycle engines has announced that Athens, Greece based businessman Filippos Papafilippou has joined Ian King as co-owner and Director of the drag race motorcycle engine specialists. Papafilippou’s business interests include Drag Store in Athens, a specialist in carbon fiber composite design and manufacture alongside it’s tuning and race preparation services. Papafilippou recently joined the multiple FIM European Championship winning and World record holding team King Racing after acquiring the Gulf Oil machine campaigned by King and built in his Puma Engineering workshops, winning his own and first European title in his inaugural year riding a supercharged nitromethane Top Fuel motorcycle. Puma Engineering was founded in 1972 by Pete Davies. Pete, an apprenticed engineer and jig borer, had developed an interest in motorcycles from his father who bought, restored and sold motorcycles at Rugby market. Whilst racing as a passenger on a Triumph twin powered grass track sidecar outfit Pete started to improve and remanufacture parts for the `fragile’ engines, and after being made redundant in 1972 started up the company making parts for other sidecar racing teams. A chance encounter with drag racer Ray Feltell at a show in 1974 saw Pete commence the manufacture of parts for drag racing applications. The first nitro engine was built for John Clift, with later commissions from John for use in his famous `Chain Reaction’ Top Fuel Triumph parallel twin. Puma is now manufacturers of the most powerful motorcycle engines in the world, and power the quickest and fastest accelerating motorcycles across the globe. They offer the complete range of parts to construct all combinations of nitromethane fuelled drag bikes; supercharged and normally aspirated, single cylinder through parallel and V twin combinations to inline 4 cylinders. Commissions from customers across the globe already include state of the art Puma CrMo chassis, billet V twin engines and a number of 4 cylinder engine combinations through to complete turnkey machines. Recent developments have included Mark 2 billet Puma 3V cylinder heads, gear driven camshaft engines, innovative barrel valves developed specifically for Top Fuel Bike applications, and state of the art Carbon Fibre injector hat and precision screw supercharger combinations. As well as offering its heavy-duty Pro1 cases as replacements for the Suzuki GS/GSX engines, Puma has been developing engines and turnkey concepts for the so-called `New Age’ Funnybikes to overcome the engine and gearbox problems associated with running a mid-6-second Funnybike using OEM design engine cases. Powered by inline 4 engines utilizing normally aspirated nitromethane injected, supercharged/turbocharged petrol or alcohol and nitrous oxide injected combinations on a pseudo-Top Fuel Bike transmission layout, these combinations permit engine setups in excess of 1000HP to be utilized if desired that could not be reliably achieved with the traditional Funnybike combinations. Available for all OEM motorcycle cylinder head stud spacing’s, crankshafts up to 95mm stroke are offered resulting in capacities of up to 2500cc. To date, well over 100 Puma engines have been built for Top Fuel and Funnybike applications. 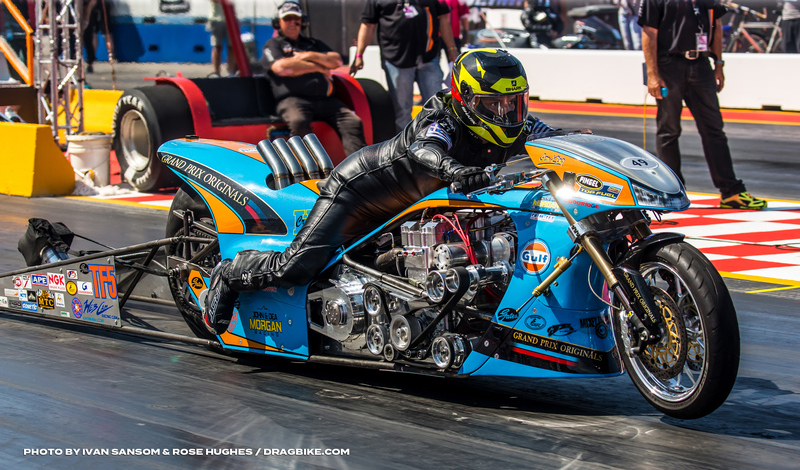 Puma powered motorcycles have broken numerous US, European, Australian and World records over the years, and have propelled many riders to championship titles, many more than any other engine in Top Fuel Dragbike history. With power outputs exceeding 1500 HP / PS and under 1600cc, Puma powered motorcycles are used in the current US, European and British Championship winning bikes, and hold the accolade of propelling multi US Champion Larry McBride to the fastest (258.27 mph / 415.64 Km/h) and quickest (5.611 secs) runs in history on a mechanically driven motorcycle on a quarter mile from a standing start.